Welcome back. Did you run and clean the bobbin case of your sewing machine as I outlined in yesterday’s post? One of the reasons that I love the Husqvarna Viking Designer Topaz 50 is that it’s super easy to clean the bobbin case area. No screws to remove, everything slips out and back into place very easily. You can’t make it more simple than that. Today, I’m going to show you several of my favorite presser feet and a couple of samples of stitching that I did. I had made a large number of flying geese units and they needed to be sewn together to make some columns of flying geese. As usual, there was a deadline for the project and no time to mess around. When you sew a flying geese unit to another one, there’s that pesky bulky seam at the corners. And sure enough, I was struggling to get those units under the presser foot without causing distortion to the width of the seam allowance. ACK – I don’t have time to mess around and sew slowly. Wait a minute – let me change the Needle Plate on the sewing machine. There are two different Needle Plates for the Designer Topaz 50. The one on the left is the general purpose Needle Plate and is required when doing any kind of decorative stitch. That makes sense since the moment the needle moves away from the center position a wider opening in the needle plate is required to accommodate the needle. The Needle Plate on the right is a straight stitch needle plate that is only used when the needle is in the center position. I’m going to talk about my favorite piecing foot in a minute, but I used to have to move my needle in order to get the 1/4″ seam allowance. That meant that I could NOT use the straight stitch needle plate when piecing. However, in this case, I popped the straight stitch Needle Plate onto the sewing machine and I proceeded to sew those flying geese together like they were butter. Not once did those bulky seams cause issues. 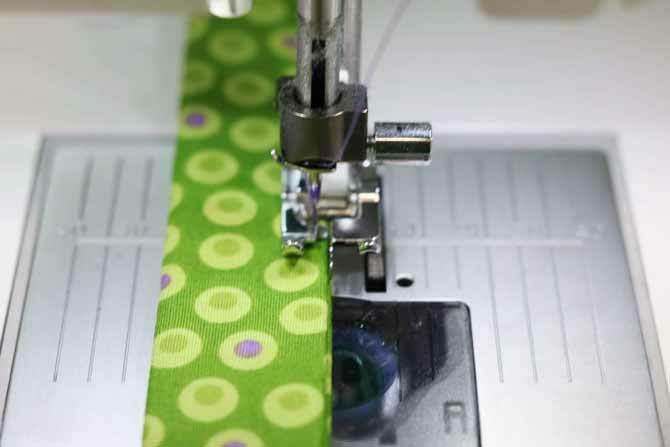 While that oval opening doesn’t look very big, it can make a huge difference when sewing. Whenever possible, I try to sew with the straight stitch Needle Plate. And if you’re afraid of breaking a needle should you select a decorative stitch, you can set the Stitch Width Safety to ON. So if you attempt to sew something other than a straight stitch, well, you can’t. And when you have the Stitch Width Safety on, you get a reminder of this setting when you turn on the sewing machine. It just doesn’t get any easier than that. I like a sewing machine that’s smarter than me because sometimes when I sit down to sew, I just sew. Here are three of my favorite presser feet. I use these ones a lot and I have one for each of my sewing machines and an extra in the event one goes missing. There’s nothing worse than needing to do applique and have no open toe applique foot available. The one on the left is the Quilter’s ¼” piecing foot. It’s wide enough around the needle hole to support the fabric against the feed dogs, it has various markings along both sides that make pivoting where you want/need to a snap and the best part, I don’t have to move the needle to the right or the left so that I can use the Straight Stitch Needle Plate. It also means that I can use the same foot on multiple machines and get the exact same seam allowance because it’s the foot, not a setting on the machine that dictates the seam allowance. That is invaluable to me. The second foot that I use a lot is the Open Toe applique foot. There are several versions of this foot in metal and plastic, but the metal one is my favorite. There’s nothing in front of the needle so I can see right into all the edges of my applique to ensure I’m getting the best coverage exactly where it’s needed. The third foot is the Edge Joining foot. I don’t use this foot all the time, but when I do, it’s very handy. I’ve got an example to show you in a minute. I need to stitch along both edges of this bag handle. I could eyeball the line of stitching but why would I when I can put the Edge Joining Foot on and use the flange as my guide. This isn’t the original purpose of this foot, but it works for me. I’m using the edge of the flange as the guide. If the line of stitching doesn’t fall where I want it to be, then I’ll adjust the “width” of the straight stitch. In other words, I’m moving the needle to the right or the left to get it in the correct position. Of course, I’ll need to use the general purpose Needle Plate the moment that I take the needle out of the center position. In the photo below, you can see that the needle has been moved to the left of center by 2.3. 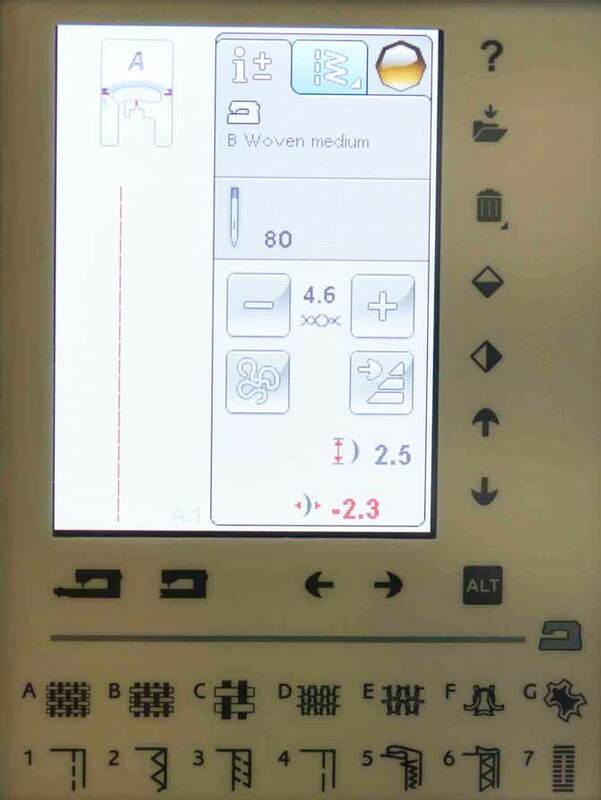 The screen also shows that the actual line of stitching has moved to the left of center. I love seeing the stitching on the screen. It takes a lot of guesswork out of setting up. Here’s my beautiful line of top stitching. The lines are nice and straight and the stitching is beautifully formed. Keep in mind, I’m going through a lot of layers for this top stitching. This is where I can set the Designer Topaz 50 to Woven Heavy on the Sewing Advisor and it will select the settings automatically. Then I used the Open Toe Applique Foot to do some applique. 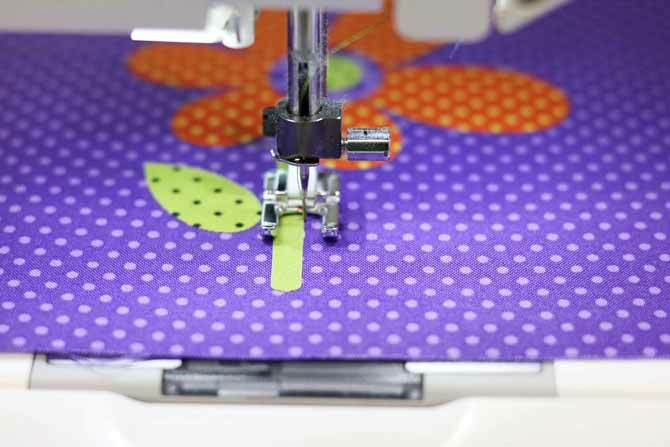 See in the photo below how easy it is to get the needle right next to the applique shape. 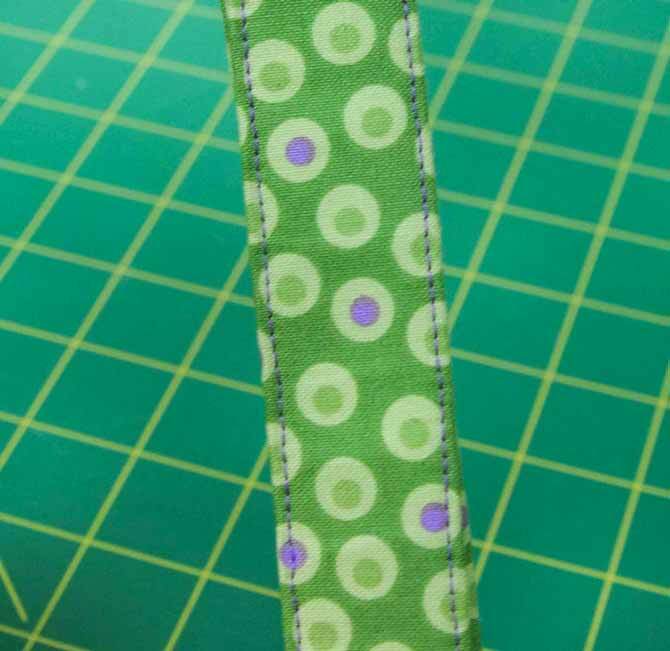 This is very important in order to have a great looking applique stitch and if you have points, indents or lots of curves, you want to see exactly where you’re stitching. Here’s the result of the applique. 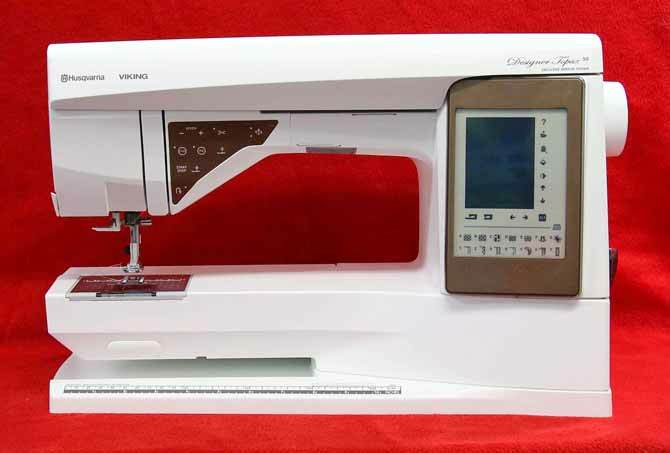 The Designer Topaz 50 has a beautiful built-in applique satin stitch. There are three default widths, but you can adjust the width to what you like and what’s appropriate for the size of your applique pieces. I thought I would get clever and try something very narrow and it looked hideous on this piece so I redid it with a wider stitch and the look is much better. Don’t forget to do a practice stitch-out so you don’t have to redo your work or rip out. 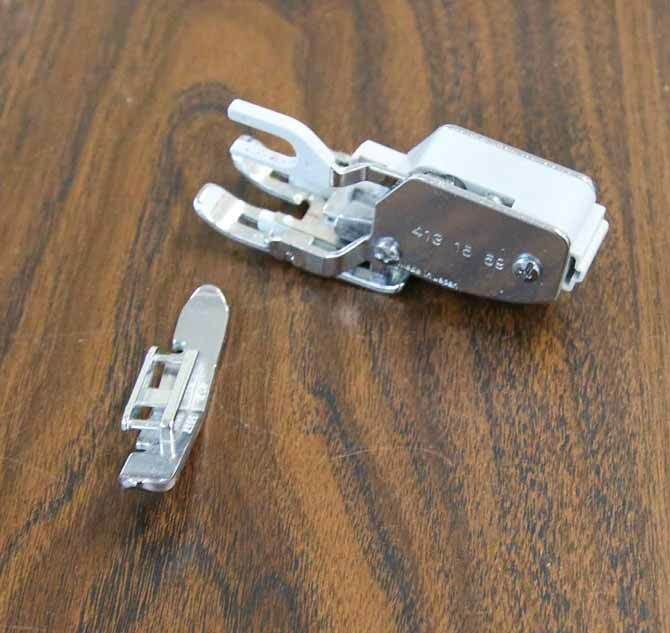 Here are two more of my favorite presser feet. These are not included with the Designer Topaz 50, but if you’re going to do any quilting (Interchangeable Dual Feed foot) or insert zippers (long zipper foot), I like these. I also use the Dual Feed foot for sewing on my bindings. Let’s just say that I get my money’s worth from the Dual Feed Foot as I seem to be sewing a lot of bindings on by machine these days. Here’s my tip for you today. 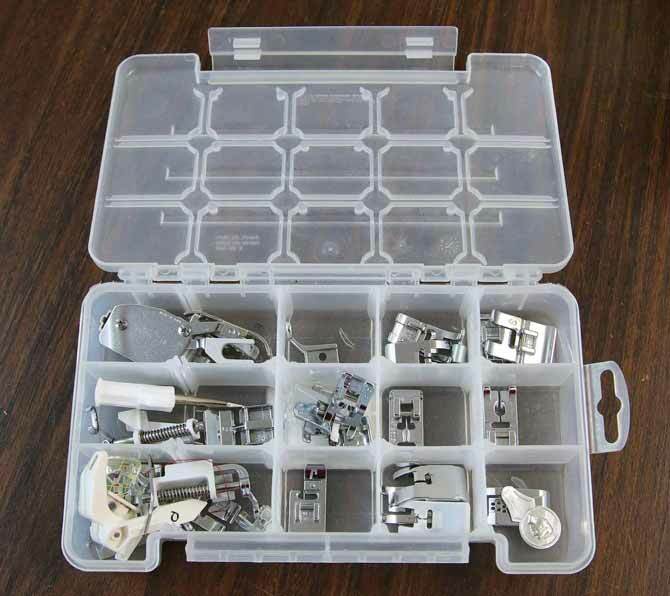 Find a handy storage box for all your presser feet. Once you outgrow the accessory toolbox, you’re in danger of losing some of them if you don’t put them all together in a safe place. I found this inexpensive plastic box worked perfectly and I know exactly where that box is located at all times. It has a ‘home’ and it always stays in that ‘home’. And that’s a wrap for today. Hopefully, you found something useful in today’s post as I shared my favorite presser feet and a few tips. 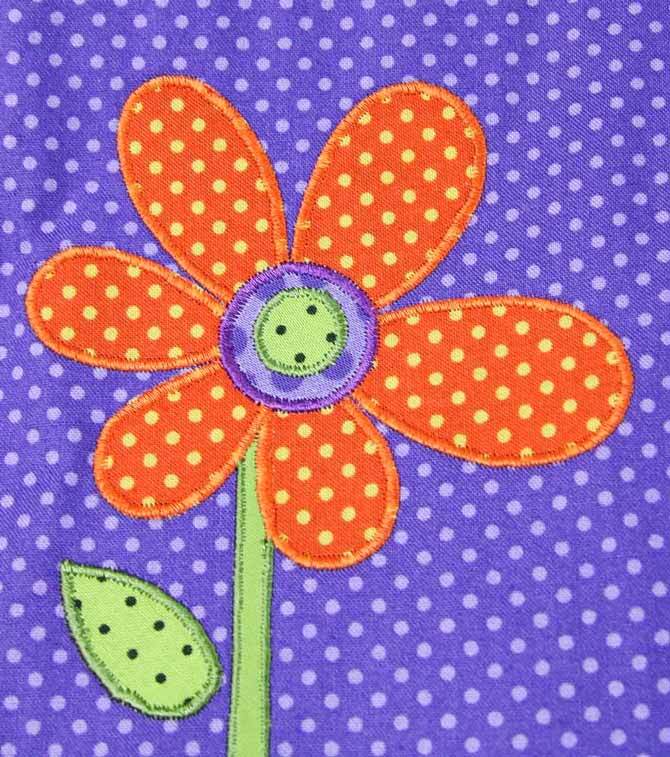 The more simple the sewing process is, the more you want to sew and the fewer hassles you encounter, the better it is. 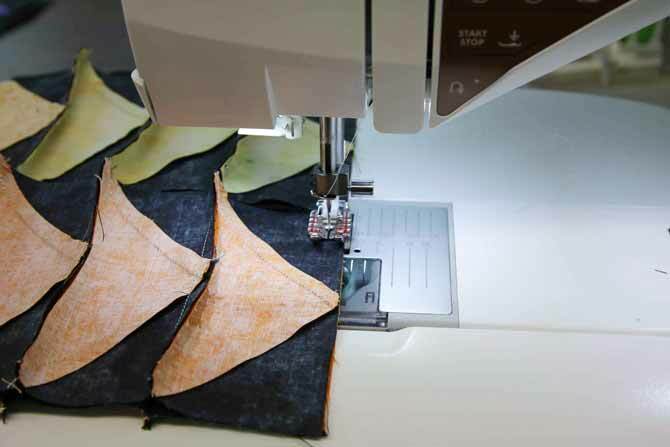 I love being able to turn on the Husqvarna Viking Designer Topaz 50 and immediately start sewing. And if I want to do something a bit different, I have a whole range of tools and options to make that happen. I’ve got a project lined up for tomorrow so be sure to come back for that.